How can I access the apps on my phone or download others? Google Play is an entertainment hub full of music, movies, books, apps, and games. You can instantly access your content from all your Android devices. Review: To show details and reviews for an app you found, just tap it. Tip: For the full list of reviews, tap See all below the third review—then tap Most helpful first or Options to customize the list. Download: To download an app you found, tap it to open details and then tap Download, or the price. Share: To share an app you found, tap it to open details and then tap. Reinstall: To show or reinstall apps you downloaded from the Google Play Store app, tap Menu > My Apps. On a computer: To find and manage apps from any computer, go to http://play.google.com using your Google account and password. There, you can browse apps on the big screen, manage your apps across multiple devices (like a smartphone and tablet), and even set new apps to download to your devices. Music, Books & Movies: You can also use the Google Play Store app to download “Music on Google Play” , “Books on Google Play” , and “Movies & TV on Google Play”. Help: To get help and more, tap Menu in the top right. Your phone comes with some apps preinstalled, and you can download and install more. 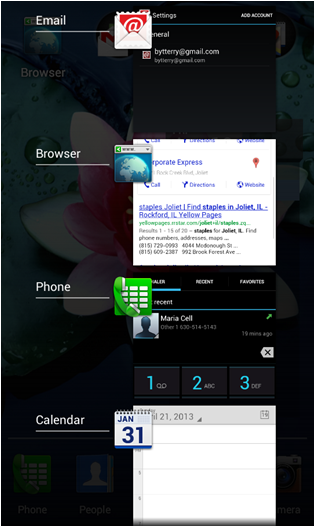 To open an app, from the home screen, touch Apps and touch an application from the list. If you’re surfing the Web and want to quickly bring up your music player to switch songs, touch Recent . This displays a list of the most recent apps you've been using so that you can switch to another. From here, you can also see all of your recently used apps. Touch the area next to the app icon to open the recently used app. Browse the Store for the app(s) you are interested in. After you download an app, the icon for that app appears in your App Tray. You can quickly get details for an app, temporarily stop it from running, or clear its data or cache. You can also restore defaults (an easy way to reset an app), or uninstall an app -- all without going through menus. The key is to use the app tray. App info - To find out more about the app's data usage, to clear its data cache, force stop, or disable the app at the top of the screen. Note: Preinstalled apps can be disabled but cannot be removed.